I am pretty sure I won’t believe that I actually qualified for the 2013 Boston Marathon until I’m at the starting line in Hopkinton next April. And I’m certain l will be a little anxious between now and September 14, when I finally will be able to submit my application with all the other BQs who met their standard by 5 minutes or more. Four years ago, when I went from running my 1st marathon in 5:17 (Marine Corps Mararthon) to finishing my 2nd in 3:54:47 (with negative splits and a portapotty stop during the 2008 National Marathon), I thought, wow, maybe some day I could qualify for Boston if I train properly and continue to age. At the time, I was almost 37 and the BQ for my age group was 3:45. I thought I might need to wait until I turn 40, when the standard eased to a more feasible 3:50, but the goal was set. I wanted to earn my spot to run Boston. My first real attempt to qualify was at the 2008 Richmond Marathon. That dream died pretty quickly. It was an unseasonably warm day and it was abundantly clear by mile 5 that the BQ dream was dead. My husband, who was waiting in the hotel lobby with our two kids wasn’t very happy that it took me 43 minutes longer than I wanted to finish (no late checkout!). My 2nd and 3nd attempts to qualify were both in Philadelphia. In 2009, I was just glad to finally run under 4 hours for the 2nd time. (That was a pretty insane training season, I ran 3 marathons in 6 weeks, no wonder I ended up with sesamoid stress fractures!). In 2010, I knew by the halfway point that it wasn’t going happen, by mile 20, I was updating my facebook status. So how the heck did I go from my most painful marathon in October 2011 where I struggled to finish in 4:07:45 and vowed to never run another marathon again … to 6 months later running 3:38:04? Oh, and during that 6 month period, how did I also find the time and energy to run two sub 4:00 marathons, one 17 seconds from my PR at the time (3:55:04) and the other my 3rd fastest marathon (3:56:07) the day after running a half-marathon (thank you Disney for creating the goofy challenge!). 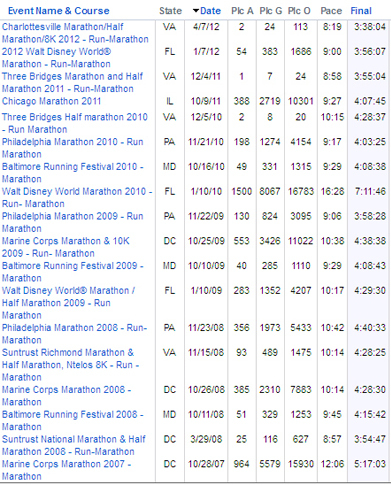 Oh and I also ran huge PRs in the 5K, 10 mile and half-marathon during a 6 week period from February 27-April 7. What is my secret? What magic food am I eating? What key workouts am I doing? What drugs am I taking? I have no clue! What I do know is that there was no straight line up to this recent success. My first real PRs, the ones from a breakout season in 2008, stayed out of grasp for what seemed like an eternity. I didn’t come anywhere close to them for nearly 2 years, and finally, after many ups and downs, tears, disappointments, and struggles, I broke them in 2011, after 3 years of seemingly no progress. Now, a year later, I’ve improved again in every distance, and by significant margins. So what is the key to my success? Part of me thinks all of this is all a fluke and I’m just lucky. I’ve had perfect racing weather and no significant injuries that have kept me sidelined. But I do know It’s important to figure out what works and what doesn’t in terms of training. So here are a few things that I do know. You cannot run too slowly during your training. Go all out during every workout and you’ll be burnt out by race day. Staying on the treadmill and in the pool keeps me from running too many miles too fast. I know this has kept me sharp on race day. “Our doubts are traitors.” Mental preparation and self-confidence is an integral part of training. Self-doubt is just as damaging as a stress fracture. I’ve learned to relax a little more before race day and make sure I have Plan A, B, C and D goals. I’ll write more detailed race day reports for the Cherry Blossom Ten Mile Run (1:12:36) and Charlottesville Marathon (3:38:05) and what it really means to me to qualify for Boston for the first time during my 18th marathon, but that’s it for now! Holy crap, congrats on BQ'ing!!! Now you actually give me hope. My marathon PR is 4:58 and that was during my first marathon 2 years ago. After that I ran Marine Corps in 5:17 and was miserable. Goofy I ran in 5:07. But I don't think I trained correctly at all and am probably going about it the wrong way. I would LOVE to BQ but I always just thought that it was impossible. I love seeing all your attempts at your BQ's because they are VERY similar to mine. I hung right around the 4 hour mark and FINALLY I hit my first BQ with a 3:37. What a relief it was that all the years of trying had finally paid off. Congrats on your BQ!!! !